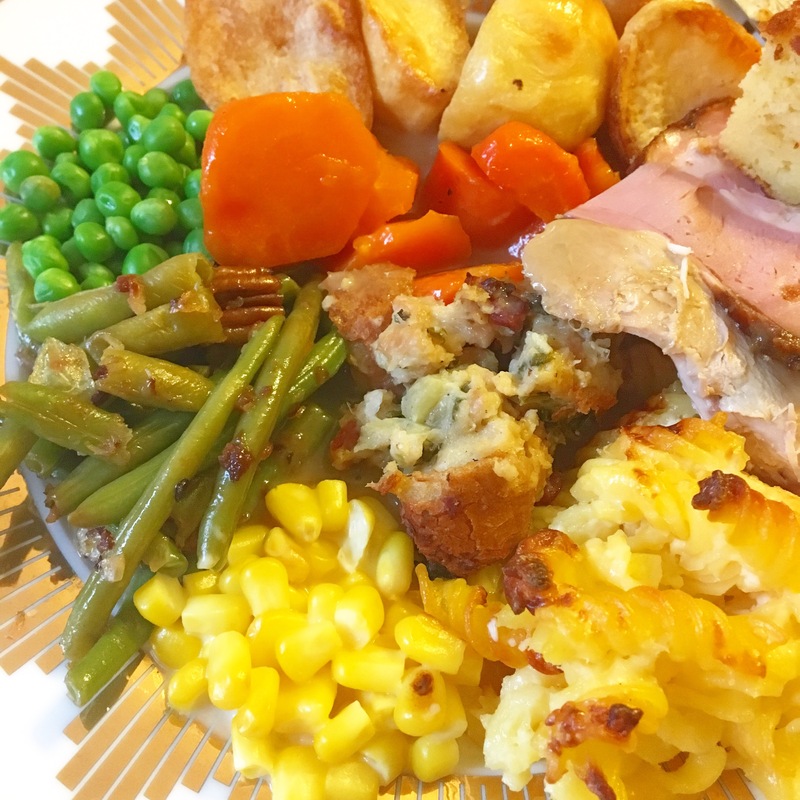 I’ve been doing Thanksgiving in the UK for years now. Partly it’s to indulge in my love of Americana, partly it’s to trial new dishes for Christmas, but mostly it’s to do a kind of Christmas with friends, which is not something that’s easy to do for a holiday that’s dominated by family. 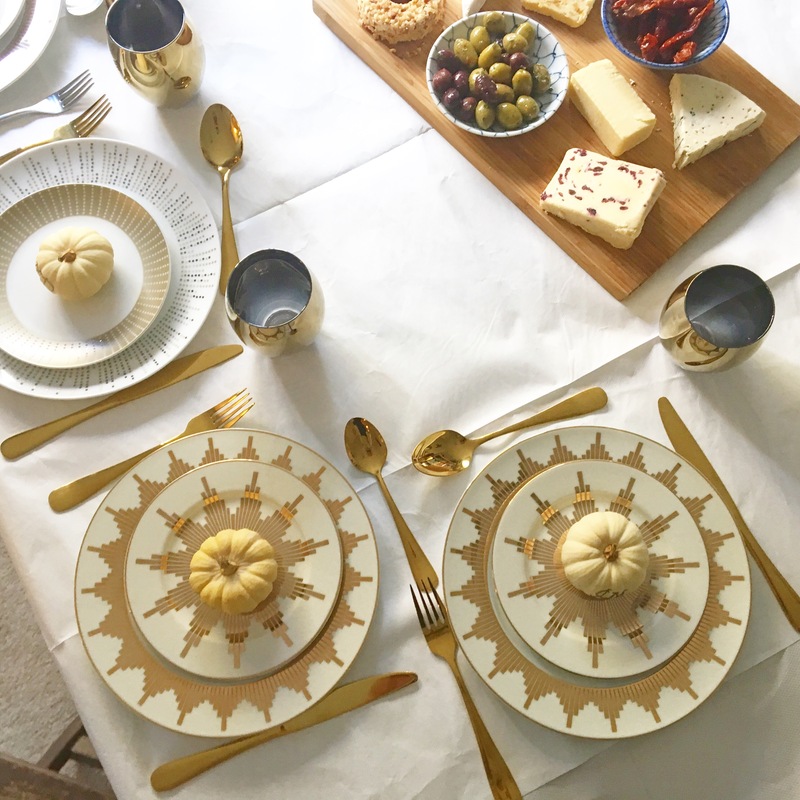 I like to call it Friendsgiving, and some people call it Friendmas, but either way, I can’t see how anyone wouldn’t want to get behind a day of fun, food and friends – no matter which side of the ocean you’re on! 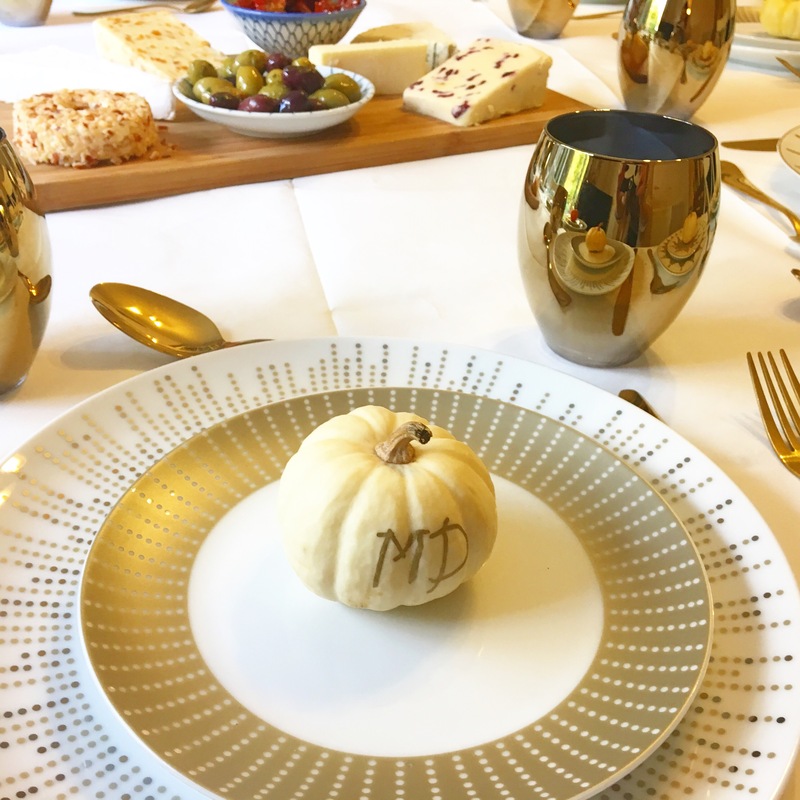 This year I used mini pumpkins left over from Halloween and used a gold Sharpie to initial the guests’ names on them – a last minute rush job, but it looks fairly decent considering I was in literal red alarm panic mode when I did it! For my starter, this year I did a really simple cheese board. 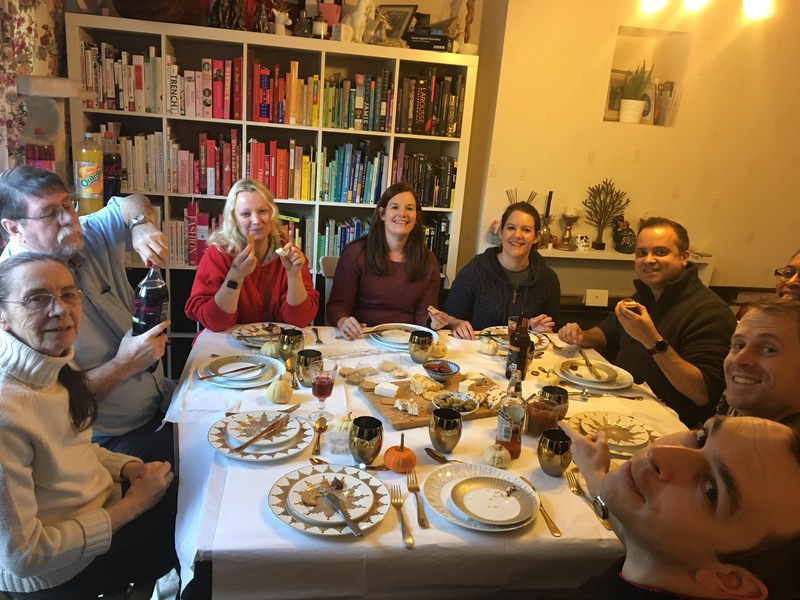 It’s so easy to throw together and gets everyone talking as they pass the crackers and talk about which cheese they like the best! 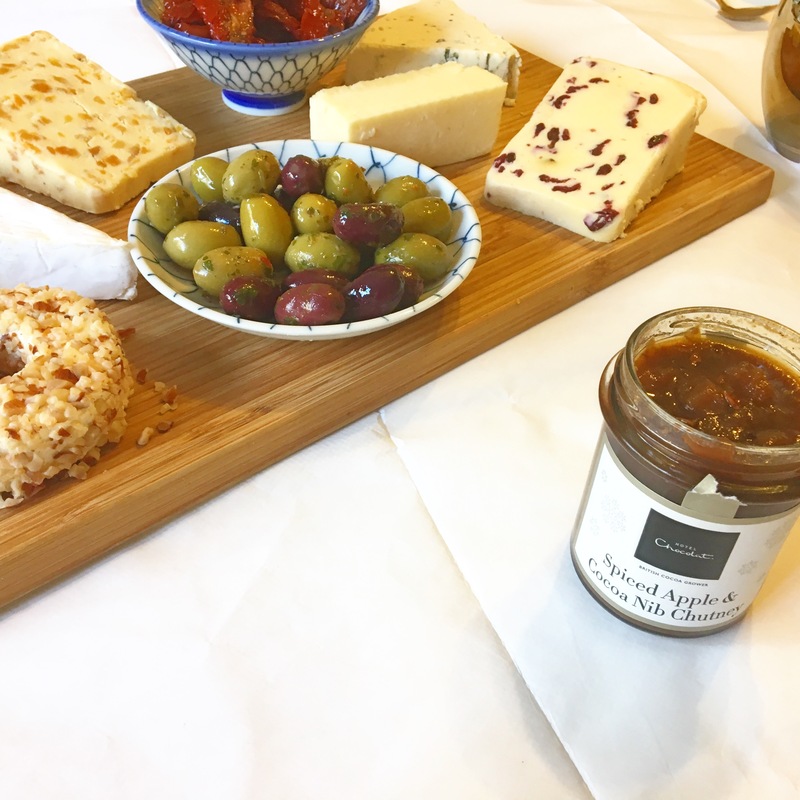 I made chutney from The Spicery’s apple chutney recipe, and served Hotel Chocolat’s gorgeous new Christmas chutney too – it went down a treat! I’m definitely picking another jar up for my Christmas cheeseboard! (Get yours here: mine was C/O Hotel Chocolat, usual RRP £5). Picking the cheeses was fun – you should get a mix of different textures and flavours, but always remember your audience. Experts say to select at least one from the four basic categories of blue, aged, firm and soft. I say, pick what you and your friends like – it’s easy to get bogged down in rules and forget the simple things! I selected Cathedral City mature cheddar, Castello Danish Blue Extra Creamy Cheese, President Brie, Castello Pineapple Halo, white Stilton with apricots and Wensleydale with cranberries. The pineapple was an absolute winner served with crackers, and I also provided sundried tomatoes and olives. 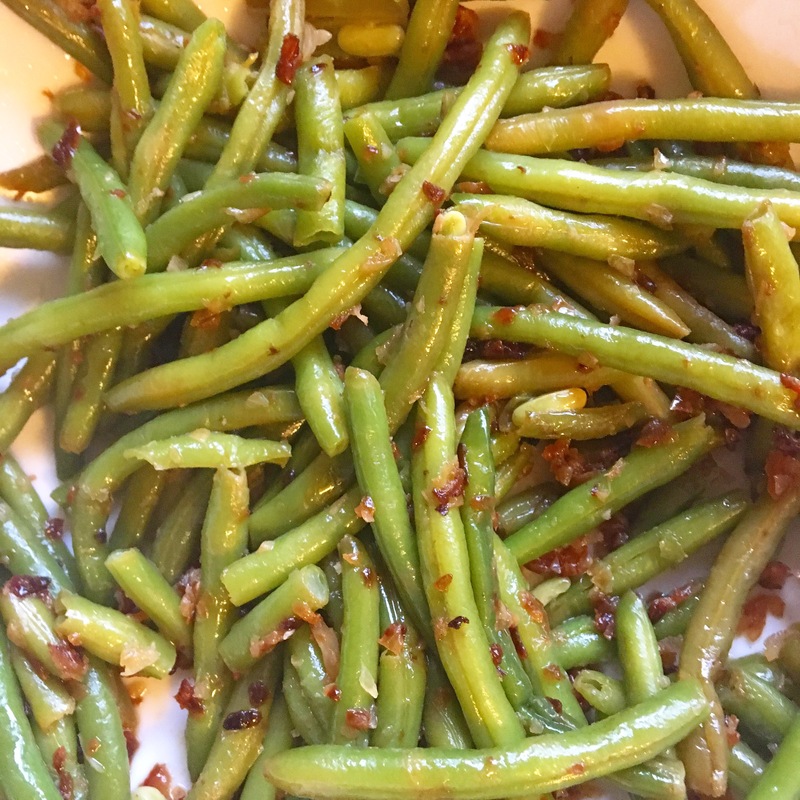 On the side was brown butter and pecan green beans, which was a massive hit and a new dish I will definitely be making again. I also made rosemary and orange cranberry sauce, cheddar cheese cornbread, creamed corn (if I don’t make this, I will be in real trouble with certain people!) apple, bacon and caramelised onion dressing (I think I’ll go back to Martha Stewart’s classic onion, sage and celery next time) roast potatoes, smoked garlic mashed potatoes, maple syrup and cracked black pepper carrots, and peas! And, my lovely foster-sister-cousin made mac and cheese! 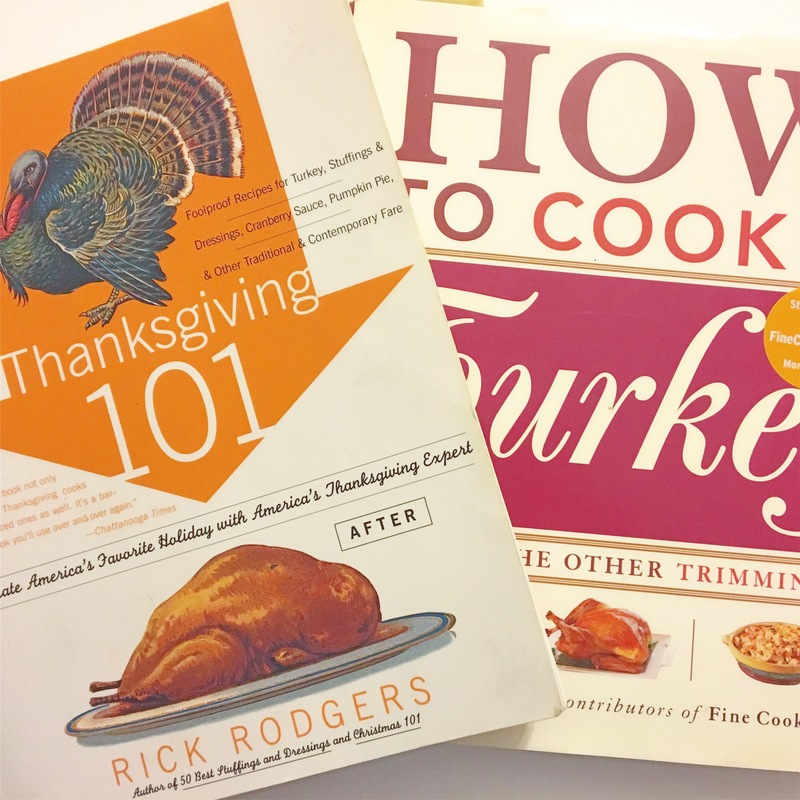 Most of the recipes I make year after year come from two books – How To Cook A Turkey from Fine Cooking and Thanksgiving 101 by Rick Rodgers. I’ve got loads of Thanksgiving recipe books, but these two are the absolute best and I would recommend them to anyone! 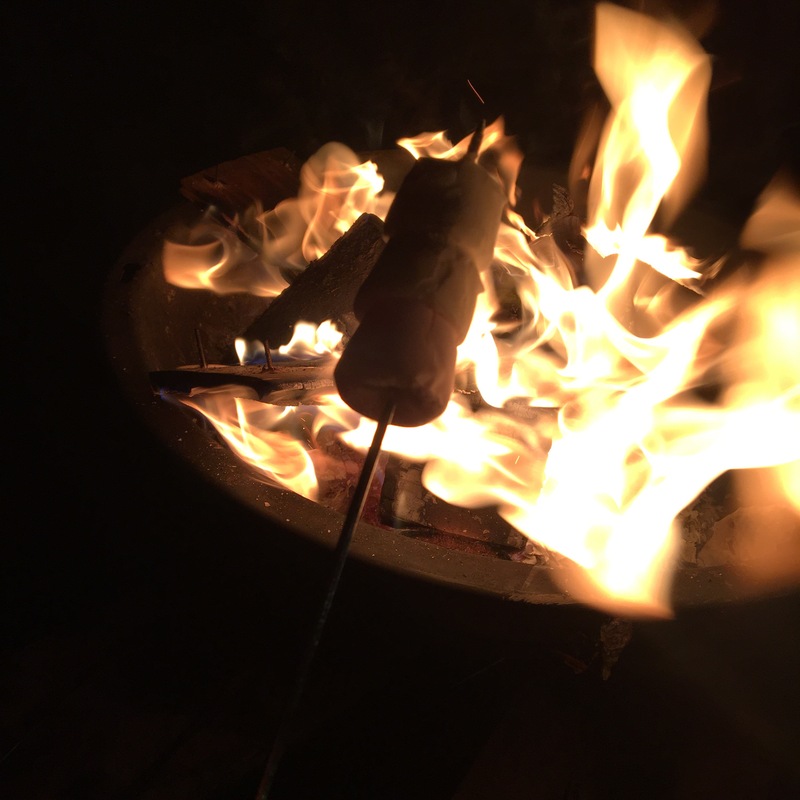 Then, pumpkin pie, apple pie and chocolate cheesecake (all made by my lovely mum), followed by fireworks in the garden and roasted chestnuts and marshmallows around the fire. 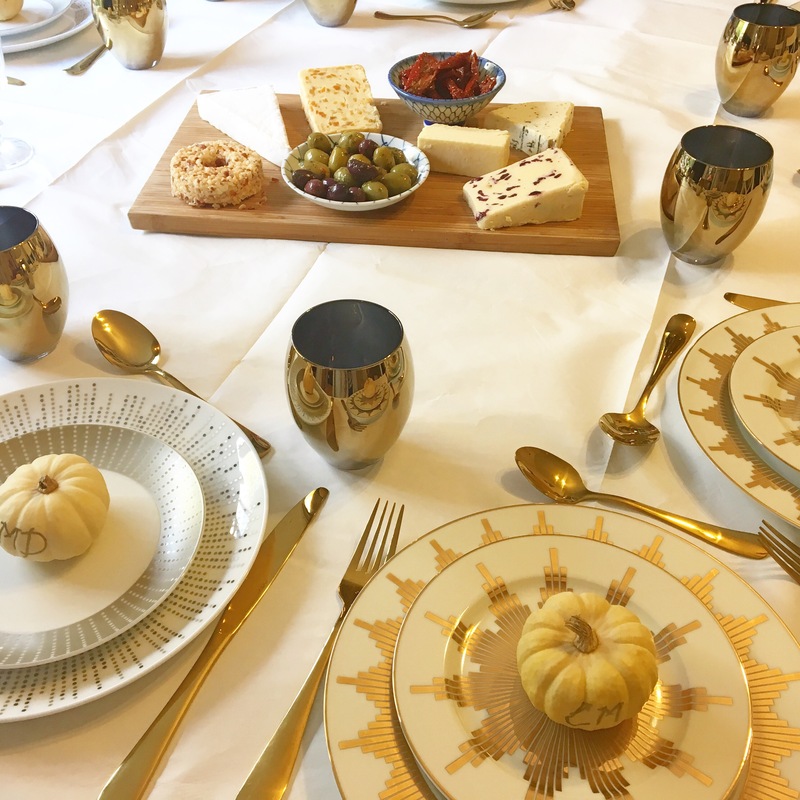 That’s because, unfettered by the American (and Canadian) constraints of time, I can have Thanksgiving whenever I like, and so I decided to have it on Bonfire Night in the U.K., to make a double whammy celebration! 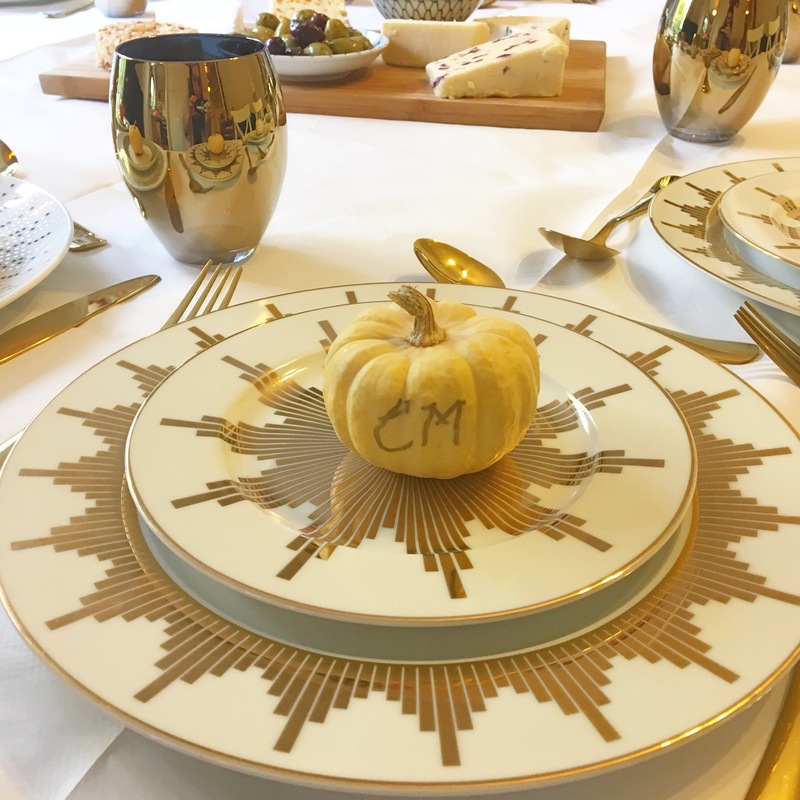 I’d love to know your favourite Thanksgiving recipes and traditions – share them with me in the comments! What To Do With Leftover Thanksgiving Turkey!